They are partly indigenous, largely unknown and dangerous. The experts have only recently made this discovery about the Borna viruses. “They can actually infect humans,” says Prof. Dr. Martin Schwemmle from the Institute of Virology at the Freiburg University Medical Center. In the 1980s, scientists had already carried out intensive searches for human Borna virus diseases - and obtained little more than unnecessary excitement. However, it is now clear that Borna viruses can cause life-threatening brain inflammations. Eleven human infections, nine of which are fatal, are considered to have been confirmed. Last year, Martin Schwemmle organized an international conference in Freiburg at which colleagues presented recent, partly unpublished cases. "The risk of becoming infected is probably extremely low," said the physician, who is himself researching Borna viruses. They even mean nothing to many people interested in the natural sciences. "They have been known in veterinary medicine for a long time, especially as pathogens in horses.” Infected horses are not part of the herd; they are apathetic. They show behavioral abnormalities and signs of depression. In 1894, veterinarians named the symptom “Bornasche Krankheit” (Borna disease): It affected numerous horses of a cavalry regiment stationed in the Saxon town of Borna. The pathogen, an RNA virus, was identified by scientists in 1935. They called it Borna virus. From the mid-1980s onwards, it enjoyed some fame in the media as a “virus that makes people sad.” Virologists had examined human samples. “Afterwards, some scientists believed that Borna viruses could cause psychiatric diseases such as depression,” says Schwemmle. But he and many of his colleagues had their doubts. Their studies showed that the results were based on contaminated samples and unreliable test methods. The Robert Koch Institute shares this view. Research into human Borna virus diseases burnt some bridges. Most experts turned away. The discovery that Borna viruses can infect humans therefore was a bombshell. “A crazy story,” says Prof. Dr. Martin Beer of the Friedrich-Loeffler-Institut (FLI) in Greifswald, who has analyzed many samples. Five years ago, a 72-year-old with headaches, movement and consciousness disorders set the ball rolling. “When he came to the hospital, he told the doctors that two of his acquaintances had recently died,” said Beer at the Freiburg meeting. All three men lived less than 25 kilometers apart in Saxony-Anhalt. 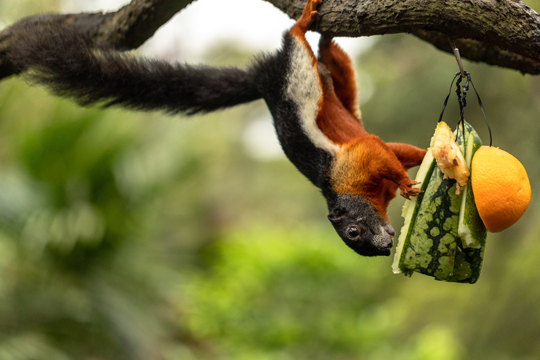 They bred exotic variegated squirrels and callosciurinae (Latin for „beautiful squirrels“) and had swapped some of the animals from Central America and Southeast Asia. When the third breeder also died, one of his animals was officially examined. A shot in the dark and a stroke of luck: the squirrel tested positive for Borna viruses - the only one in the 72-year-old’s breed, as it turned out later. The FLI sequenced the genome of the virus: it is a new species, a hitherto unknown squirrel Borna virus. 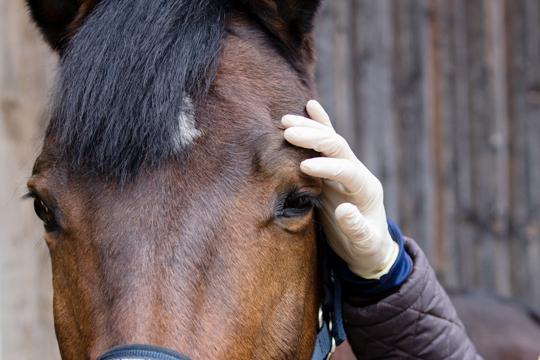 A short time later, however, FLI researchers detected the classic “horse” Borna virus in samples taken from other patients with brain inflammation. In Freiburg, Beer and Prof. Dr. Armin Ensser from the Universitätsklinikum Erlangen presented three other current fatal brain inflammations from Bavaria: Their tests also detected the classical Borna virus in their patients. The molecular background is what interests Schwemmle most. Borna viruses do not kill the cells that they attack. Instead, the immune system takes over that function: in order to eliminate the pathogen, it attacks infected cells. The majority of these cells are located in the brain, which leads to brain inflammation. Neurological deficits can occur beforehand. Borna viruses interfere with signaling pathways in nerve cells, says Schwemmle: “They cause some of the enzymes involved to perform other tasks to such an extent that they can no longer do their job.” Schwemmle and his colleagues are working together on several projects. Clarification is urgently needed: The experts still know very little about the natural transmission pathways of Borna viruses and the course of brain inflammation.